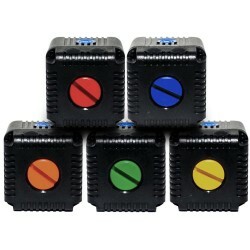 LUME CUBE - Color Cap Kit Keep track of your Lume Cubes with our Color Cap Kit! 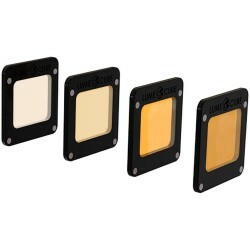 LUME CUBE - CTO 4 Pack for Lighthouse Perfect for shooting in different environments, the CTO (Color Temperature Orange) 4 Pack comes with 4 different warming gels which allow you to adjust the Lume Cube's color temperature. LUME CUBE - Diffusion Bulb Pack for Lighthouse With the magnetic Diffusion Bulb pack, you're able to soften the light output of the Lume Cube and create a unique and balanced throw of light. 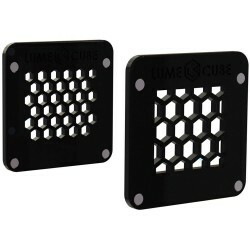 LUME CUBE - Honey Comb Pack for Lighthouse Honeycomb Pack includes 2 different sized grids which allow you to alter the shape and intensity of light output from your Lume Cube. LUME CUBE - LED lučka - na zalogi Made to fit your lifestyle, whether you're loyal to Apple or Android, the Lume Cube is ready to pair with your smartphone. Our free app lets you control flash, duration, and brightness of multiple cubes. 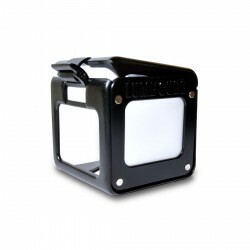 LUME CUBE - Lighthouse + 3 Diffusers The perfect light modifying system for your Lume Cube. This kit includes a form-fitting Aluminum housing and 3 Magnetic Diffusion Filters allowing you to use one filter or stack multiple. 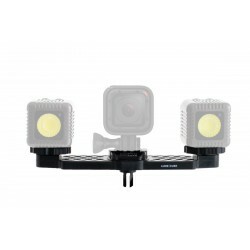 LUME CUBE - Smart Phone Video Mount This mount is the hub that brings together high quality video, professional lighting and unmatched portability, making it easier than ever to capture inspired video footage on the fly, day or night.